Guarantee a clean kill with the hammer of Thor - in the form of Sellier & Bellot’s .300 Winchester Magnum 180 grain soft point ammo! Hail to the King of Hunting, the .300 Winchester Magnum. With over 50 years in the field, the .300 Winchester Magnum is the most popular .30 caliber hunting round in the United States. 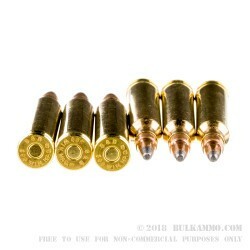 Loaded with a hard hitting 180 grain soft point bullet at almost 3000 feet per second, these rounds are suitable for taking any North American large game, up to and including the fearsome grizzly bear. Manufactured by Sellier & Bellot in the Czech Republic, like all their products these rounds are the definition of affordable quality. 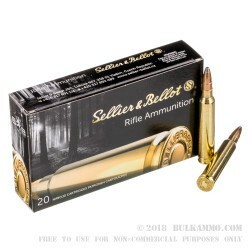 Sellier & Bellot is the largest manufacturer of ammunition in the Czech Republic, and makes rounds for the US commercial market as well as several nation’s governments. At their facility, they load these .300 Winchester Magnum rounds on new manufactured brass which is suitable for reloading. 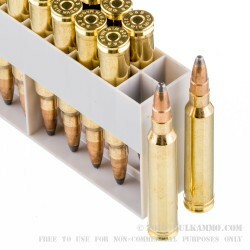 These .300 Winchester Magnum rounds are packaged in boxes of 20, with the cartridges themselves in slotted plastic trays. Q: How much energy does this ammo have?